Oceania is a vast, spread-out region, encompassing Australia, New Zealand, and the South Pacific islands of Melanesia, Micronesia, and Polynesia. How will you find and reach all of the key business contacts here? 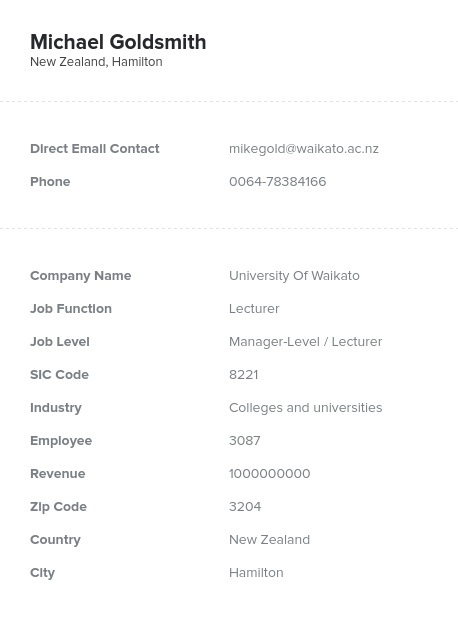 It's easy: Just buy this Oceania email database. The nations of Oceania are a largely untapped market in many domains of the business world. Reach out to valuable contacts who would love to hear about your products using this Oceania mailing list and you'll be able to make sales in places great and small, from big cities like Sydney, AU, and Wellington, NZ, to tiny island nations like Nauru and Tuvalu. We've compiled a plethora of valuable sales leads all across this region into one pre-built, verified business database, so you can skip the data-gathering and get right to forming B2B relationships and making sales. It can be tricky to get accurate contact information for people in parts of Oceania, but we've gone the extra mile to do it. Here, we've gathered together a reliable email list of Oceania contacts that we've double-checked to make sure that every scrap of information is useful to your marketing campaign. First, we put each B2B email list we sell through an automated process to strip out duplicated, incorrect, or outdated details. Then, our team of real human authenticators goes over everything to make sure that no error has been overlooked. We do this on a regular basis with every one of our targeted email lists. It might sound like a lot of work, but it's worth it to ensure that you get a quality data product. Buy this list today and enjoy the benefits of our efforts!